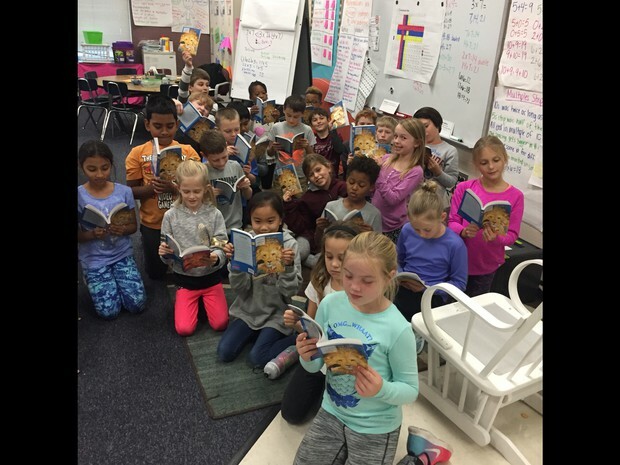 Reading- We started a new read aloud book this week- The Lion, The Witch and The Wardrobe. It is one of my all-time favorites! :) It really lends itself to talking about descriptive language and author's craft! Math- We have finished up Unit 2- multiplication and will be taking a post-assessment on Monday! Science/Social Studies- We have started our E4Tech lessons! Yay!!! Module 1 has a heavy math and computer science focus, but will tie into Module 2, which is heavily science. Social Studies will be ongoing throughout the year with our Flat Stanley projects being mailed out (hopefully we'll start getting mail soon), and our classroom economy system. Writing- We finished up our informational writing pieces and will begin narrative writing next week! We had a kick-off assembly on Tuesday to introduce our One School, One Book project for the month of November. Students were so excited to get started reading, especially because everyone left with a book! The PTO purchased a book for every student. How awesome is that!? Throughout the project you can visit https://sites.google.com/napls.us/naps-osob/home to stay updated on tasks, see videos of special people reading the chapters, and view pictures/videos of students. Thanks to your Scholastic Book orders, I was able to use points to order EVERY student a copy of our current read aloud book, The Lion, The Witch, and The Wardrobe. This book is theirs to keep! There's something so special about putting books in kids hands, and you're making that possible! Our schedule has been crazy, and I've felt like Genius Hour, inadvertently, keeps getting pushed to the back burner! However, I'm going to make sure we commit one hour, the next few weeks, to really diving into our research. Reminder: Wednesday, November 8th, will be a late start for students.